Are you getting the ORA-00933: SQL command not properly ended error? Learn what causes it and how to resolve it in this article. The solution to the ORA-00933 error is to update your query to remove the clause that’s causing the issue. This would depend on the type of query being run. Let’s take a look at some example solutions. You have a JOIN keyword (such as INNER JOIN, LEFT JOIN) in the query. You have an ORDER BY in the query. This statement fails because the INSERT statement does not support ORDER BY. When you insert data, you don’t need to specify an order. The data is inserted into the table anyway, and the ORDER BY is only used for SELECT queries. Refer to my guide on the Oracle INSERT statement here for more information. This statement should now run without errors. Read my guide on the Oracle UPDATE statement for more information. The error appears because the ORDER BY does not belong in a DELETE statement. The ORDER BY is only for ordering data returned by a SELECT statement, and serves no purpose in a DELETE statement. You can refer to my guide on the Oracle DELETE statement for more information. Are you getting an “ORA-00933 sql command not properly ended” in a SELECT query? Well, the SELECT query can support joins and ORDER BY, so what could be causing it? Your SELECT statement is using UNION or UNION ALL, and you have an ORDER BY at any point except the end of the query. You can only have an ORDER BY at the end of the query, not within each UNION. You have forgotten a comma in between tables when selecting them. You’re running Oracle 8i and trying to use INNER JOIN keywords (or similar join keywords). These were implemented in Oracle 9i. Check that you have the right clauses for your query and are in the right place (e.g. not missing a FROM clause). Check that you’re not missing a comma anywhere, such as in the SELECT clause or the FROM clause. Check that you’re not missing a bracket anywhere. This can be made easier with SQL Developer’s matching bracket highlighting or formatting the SQL to see if something is missing. Other IDEs have similar features. So, that’s how you resolve the ORA-00933 error. Ben, I am getting ORA-00933, so I’ve been looking for help online. Most all the answers I’ve seen assume that the query is performing things that mine does not, like UPDATE, DELETE, etc., or some JOINs or UNIONs. Mine is just a select from 4 input files which asks for COUNT(*). You know your stuff, so I'm hoping you can spot something I'm doing improperly. I've checked commas, brackets, spelling, etc. to no avail. This is being run in Encompass Designer which is our company program for setting up campaigns, but it's running Oracle, and I just don't see the problem. If you can help, thanks. I think the issue is that your GROUP BY comes after the ORDER BY. 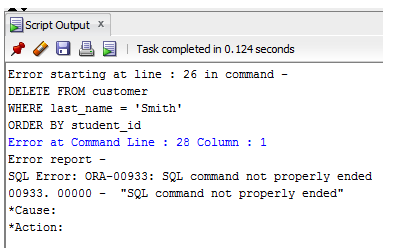 SQL requires that the ORDER BY is the last line in the query, even after GROUP BY and HAVING and everything else. Also, have you considered using JOIN keywords instead of matching on tables in the WHERE clause? JOINs are generally preferably because they explicitly say how two tables are joined, and it's easy to tell them apart from WHERE conditions that filter data. Let me know if you have any issues/questions with this! Thanks, Ben. I eventually figured it out. It’s strange how sometimes the basic constructs of a language can trip one up. So, I got it fixed, but I appreciate that you went the extra step of recommending using JOINs instead of WHERE conditions. I’ll admit I don’t really know the rules that would determine that choice. Obviously, both approaches work for this query, but are there case where the WHERE conditions would be preferable to JOINs? I don’t know if there would be a situation where the WHERE conditions are preferable to JOINs. Perhaps in a small query, or something that’s just quickly written to test some data, it might be easier to write it using WHERE conditions. Actually, one reason to do it this way is if you’re following coding standards in your team. If, for some reason, the team has determined they want to write JOINs that way, then it’s often better to stick with the team standard.